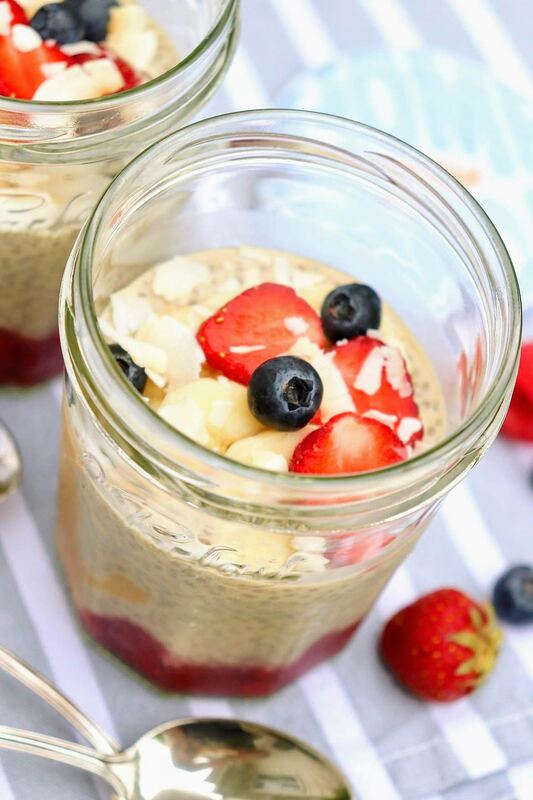 An option to overnight oats, healthy, prep-ahead PB&J Chia Pudding makes me feel great and is surprisingly satisfying. Feel free to use your favorite jam in place of the chia jam recipe and customize with your favorite fruits and toppings. Cha-cha-cha chia!  I know what some of you are thinking. 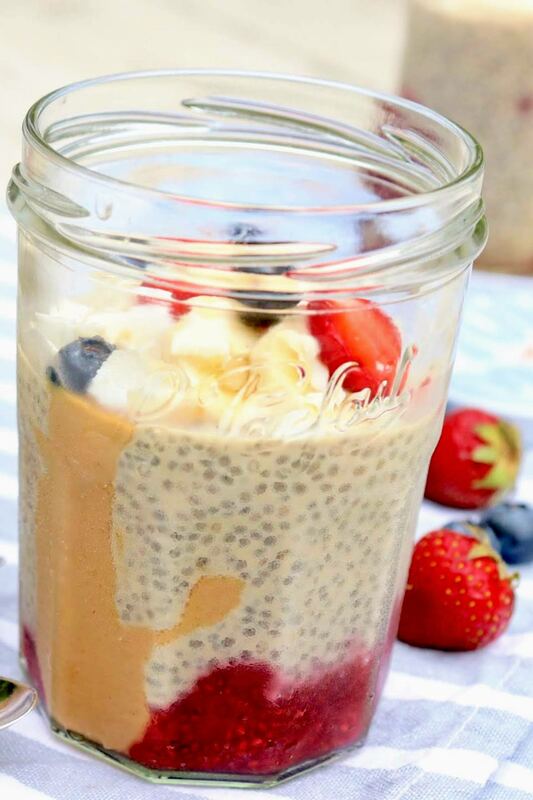 Pudding made from chia seeds? Maybe you’ve heard of this and think it sounds somewhat…well…questionable. I actually put off sharing this recipe for several years, figuring more people would be inclined to run the other way rather than try it! But the times they are a changing, and I know many of you have an inner risk taker in you!  And when you give this easy, super healthy recipe a try, you might just be surprised by how much it grows on you. Then you’ll be doubly happy because I’ve seen chia pudding for sale in stores for upwards of $5 for a small serving! 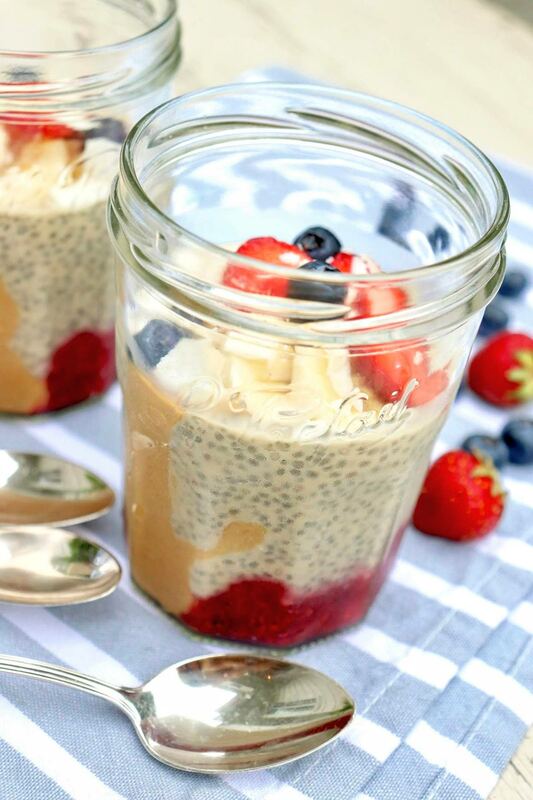 So here’s how it went… The first time I made chia pudding, I was simply intrigued. I regularly used small amounts of these über-healthy seeds in things like overnight oats and bread. Redeeming as they are (they’re loaded with omega-3s, antioxidants, iron, calcium, fiber, and protein), I was prepared to not be totally smitten with a dish that elevated these tiny black seeds from supporting player to starring role. The first time I tried, the plumped up seeds gave me vague memories of tapioca. But I kind of liked it. So I tried various versions in an attempt to add appealing flavor and turn the pudding into something I would actually look forward to eating. After several tries and a little inspiration from the familiar flavors of the classic peanut butter and jelly sandwich, I was truly smitten. 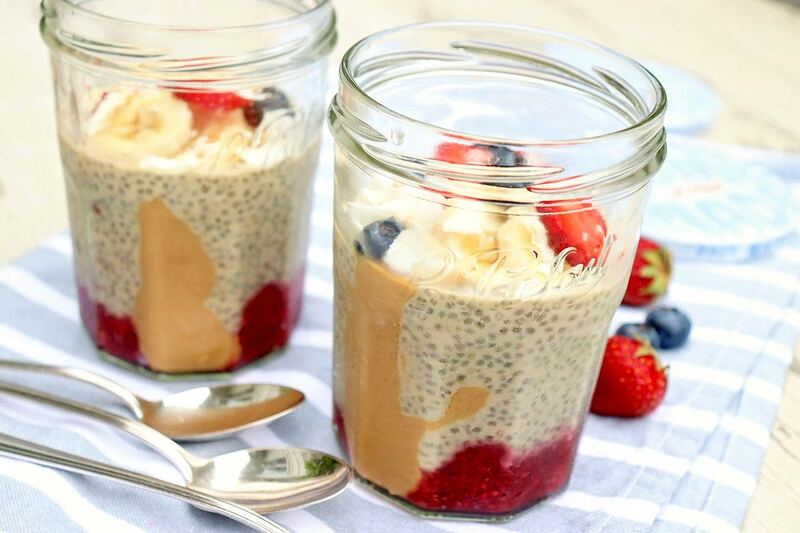 Since I’ve now started my day with the following PB&J chia pudding too many times to count–and truly look forward to it–I figured it was time to share. I’ve also noticed that I feel really good after I eat this. It’s light, yet the peanut butter provides protein and staying power, and I can bulk it up with lots of fruit…or keep it simple. Typically, I stir in half a banana, chopped, and a handful of berries. The chia jam is optional. You could certainly use your favorite store-bought or homemade jam or jelly, but I will tell you that this three ingredient recipe is as EASY as it is healthy. Lately I’ve been making it with fresh strawberries (and I’ve started doubling the recipe to have enough for a second batch of chia pudding later in the week), but frozen raspberries might just be my favorite. Their tangy sweetness adds a punch of flavor that’s so darn good! Plus the year-round convenience of frozen fruit is always appreciated. As an option to the chia jam, you can use three tablespoons of your favorite jam, jelly, or fruit spread. Or try with my strawberry rhubarb sauce, blueberry sauce or search the word jam for a variety of other homemade options. A delicious, healthy, and satisfying snack or breakfast that’s naturally gluten-free, dairy-free, and vegan. This healthy, prep-ahead breakfast makes me feel great and is surprisingly satisfying. Feel free to use your favorite jam in place of the chia jam recipe and customize with your favorite fruits and toppings. Add the fruit to a small saucepan. Warm over medium-low heat until bubbling. Cook for approximately 5 minutes, stirring occasionally and mashing the fruit with a fork as it cooks, or until the fruit breaks down and becomes syrupy. Remove from the heat and add the 1 tablespoon of chia seeds and maple syrup. Stir to combine. Taste and adjust sweetness at this point. I often add another teaspoon of maple syrup if the berries aren’t exceptionally sweet. Divide the jam among three 8- to 12-ounce jars or glasses. Set aside. In the meantime, add the peanut butter, maple syrup, and vanilla to a medium bowl and stir well. Drizzle in a just a few tablespoons of the milk to start, and stir to thoroughly combine. (Tip: It all the milk is added at once, it’s difficult to evenly incorporate the peanut butter. I use a dinner fork as a whisk.) Whisk the remaining milk and the pinch of salt, going slowly with the milk until the peanut butter is completely incorporated. At this point you may taste and adjust the flavors as needed, adding more maple syrup for sweetness or peanut butter for saltiness. Next, divide the chia pudding over the jam in the three serving glasses. Cover and place in the refrigerator to chill, preferably overnight for the best pudding-like consistency. To serve, top with fresh berries and/or other optional toppings of choice. The prepared puddings will keep, covered, in the refrigerator for 3-4 days. *You can cook frozen fruit without thawing, but it’s easy to scorch it. For best results, I add a tablespoon or two of juice or water and thaw the fruit over low heat before proceeding. **If it’s cold and firm, allow the peanut butter to soften to room temperature or gently warm in the microwave before trying to incorporate it with the milk. **For a little extra oomph, you can take an additional teaspoon or two of peanut butter and spread it down one side of the individual jars or glasses, keeping the layer on the thick side. When eating, you can scrape a little onto each bite. I’m just about to make my second batch of this and am a new fan. The taste and concept has grown on me every morning, so much so that I’m not messing around this time. I’m doubling the batch! Wonderful! So glad you’re a fan, Lisa! My daughter in Colorado found your P&J recipe, made it, loved it and told me about it the same week you published it and I had also made it. We both love it! Dorothy, I’m so happy you and your daughter made this and enjoyed. Thanks for letting me know!